7th February 2017 York Chang has an aptitude for words. His command of language and heightened awareness of semantics, derived from his parallel practice as a civic defense lawyer in California, informs his work and his pedantic nature. His first UK solo show, “Zero Sum Games,” at London’s Edel Assanti gallery, is compelling. His installation CMYK (2016) comprising four 55 gallon steel oil drums, positioned at intervals toward the back of the gallery, extend this investigation of journalistic credibility. He quantifies the results of his systematic survey and analysis of four print newspapers over the past 40 years. Each drum is filled with a volume of cmyk ink—green, blue and a deep purple—diluted to reflect the ratio of editorial content to images and advertising in this collection of newspapers. According to Chang’s measurements, written content has dropped to the extent that the ink is significantly watered down—to be precise, by 2 parts to 5. He attributes this to the pressures of online journalism and hopes that giving presence to this statistic will point to the general loss of influence of print; although he was keen to remind us that data is problematic and misused. Given Chang’s role as a lawyer, he is clearly compromised. As his discrete Self-Portrait (2012) suggests, there is both a willingness to inhabit his legal role with the caveat that he retains a critical distance. Self-Portrait, a cease and desist letter written by Chang on behalf of an artist who was being evicted by her landlord, shows this negotiation of his legal vocation and personal values. The main body of the letter, recounting legal acts and evidence, is scrubbed out to reveal a message, a quotation from Jean Baudrillard, circled in red: “One dreams of a stealthy idea which would slip through all the detection systems without being spotted, and unfailingly reach its target.” As Chang described, he wants to create space for human qualities within the edifice of law. Concerned with understanding deception, constructing and challenging institutional systems of truth, Chang’s work is intricate and provides an intelligent exploration of information and language in a period of unprecedented data exchange. The artist is keen to note the “flimsiness” of this material and will, as he told me, continue to seek the potential for deriving counter-narratives and formulating alternative histories. 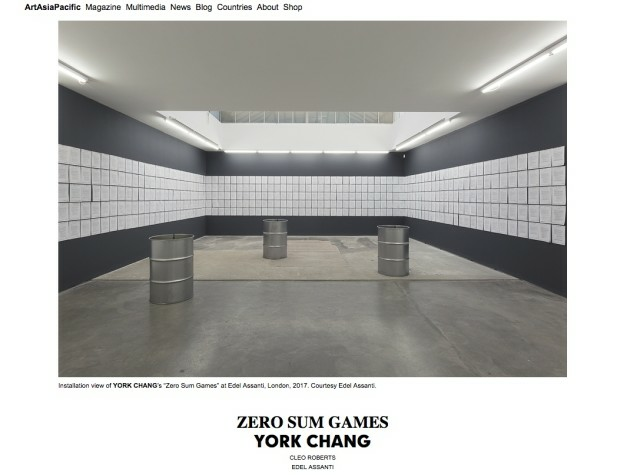 “York Chang: Zero Sum Games” is on view at Edel Assanti, London, until February 18, 2017.